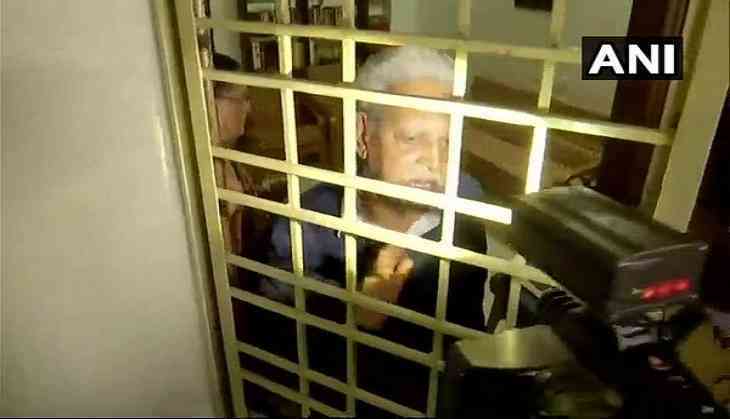 Varavara Rao, one of the activists who has been put under the house arrest in Hyderabad for having alleged links with Communist Party of India (Maoist) [CPI (Maoist)] in connection with the Bhima Koregaon violence, said on Thursday that the police has framed him in this case on the basis of false statements. On Wednesday, the Supreme Court directed the Pune police to keep the five accused activists --Rao, Arun Ferreira, Gautam Navlakha, Vernon Gonsalves and Sudha Bhardwaj--under house arrest till September 5. These activists are under police scanner for having links with Maoists and also being allegedly involved in triggering violence at Elgaar Parishad, an event to mark the 200th year of the Battle of Bhima Koregaon, in Pune that took place in January this year. Speaking to ANI, Rao's lawyer Mihir Desai, said that these latest orders of house arrest for the arrested activists clearly show that the judicature is perturbed by the sudden act of authorities to imprison them. An outrage grew over the detention of these activists after scores of leaders from various political outfits of the country said that it is an attempt to stifle dissent. Janata Dal (United) leader Pavan K Varma on Wednesday told ANI that if the Narendra Modi-led government failed to produce any evidence against the imprisoned activists then the current scenario will exude a reflection of Emergency. Senior Congress leader, Salman Khurshid, also towed the same line and said that 'an atmosphere of imposing restrictions on dissent is growing in India'. He also added that the many people who are raising their voices against the Centre are being suppressed.